Home > Hallmark Ornaments By Year > 2010 Hallmark Ornaments > View All 2010 Hallmark Ornaments > 2010 Christmas Cupcake #1 - Oh So Sweet! 2010 Christmas Cupcake #1 - "Oh, So Sweet!" First in a NEW SERIES for 2010 is "Oh, So Sweet" in the Christmas Cupcake series. 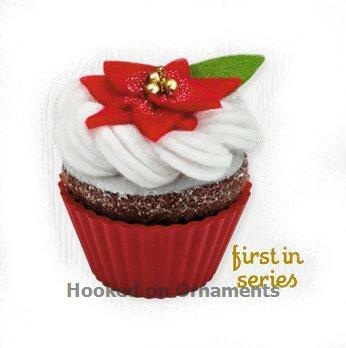 Each ornament in this new series will feature a delightfully decorated cupcake. This ornament is fabric and handcrafted. without at least one homemade treat! * This ornament is dated "2010" on the bottom of the ornament. The date is "molded" into the cupcake liner and is not a prominent part of the ornament design. My granddaughter missed the first of the series so I was very pleased to be able to find it for her at a good price.